A project charter is the statement of scope, objectives and people who are participating in a project. It begins the process of defining the roles and responsibilities of those participants and outlines the objectives and goals of the project. The charter also identifies the main stakeholders and defines the authority of the project manager. Follow our quick guide to writing and executing on your project management charter below, and be sure to get our free downloadable Word template to help make the process more efficient. Get a free project charter template! 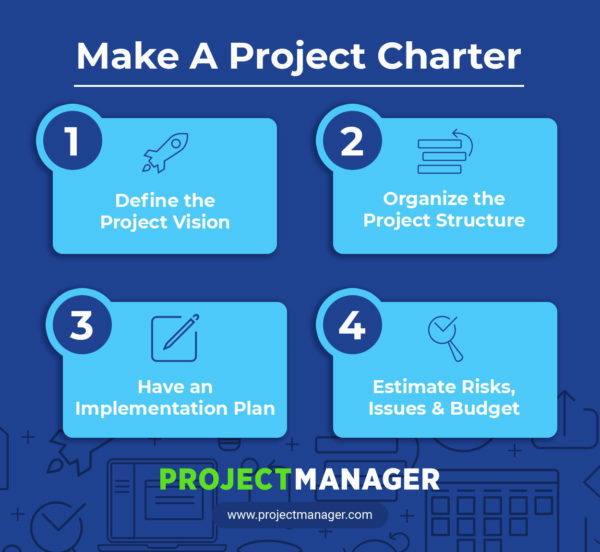 The project management charter serves as a reference document. It should outline these three main points. What is the essence of the project? What are the goals and objectives of the project? How are you planning to reach and achieve these goals and objectives? Provide a shared understanding of the project. The charter should communicate its value and/or reason for existence to every person who has a part in it, from the team to the project manager, stakeholders, sponsors, etc. Act as a contract between the project sponsor, key stakeholders and the project team. By noting the responsibilities of each party involved in the project, everyone is clear what their duties are. What Does the Charter Document? So, those are the broad strokes, and while a project statement doesn’t need to go into great detail, there is more to it than these general statements. The definition of the project should be short because it refers to more detailed documents, such as a request for proposal. One of the key parts of any project statement is to establish the authority assigned to the project manager. Other purposes of the document are as follows. What are the reasons for undertaking the project? Note them here so everyone is clear about why they are doing what they are doing. What are the objectives and constraints of the project? This is the what part of why you’re undertaking the project. If you don’t have a clear target your project is going to miss the mark. What are the directions concerning the solution to any constraints listed above? You want to have at least an outline of how you’re going to deal with project constraints. If you don’t cover it now, you’ll have to play catch-up later. Who are the main stakeholders? It’s always crucial to note the stakeholders in any project for they’re the ones who you’ll be reporting to and, in a sense, managing their expectations. The sooner you know who they are, the sooner you can build a productive relationship with them. What are the in-scope and out-of-scope items? Scope is the boundaries of your project, such as its start date and when it concludes. So, what are the in-scope items, such those parts of the project process as opposed to tasks or actions that lay outside the step-by-step process of the project? What are the potential risks in the project? Identify all risks that could arise in the project so you’re not taken by surprise. This should be followed up by a risk register and risk management plan in your project plan, where you detail how you’ll resolve those risks and who on the team is responsible for catching and fixing them. What are the project benefits? A good way to sell the project is to have a sense of what good the project will bring to sponsors and stakeholders. Figure out what those benefits are and list them here. What are the project costs? While you’ll go into greater detail when you create the project budget, here is where you want to get a ballpark figure on what you expect the budget for the project to be and who will have spending authority. What Are the Uses of A Project Charter? There are a lot of documents necessary to run a project. Before you even get started there are many you have to create, from a project plan to a project budget and more. All these documents delve into detail on the items you’ve broadly stroked out in your project statement. So, why do you need another document, isn’t it redundant? You need it to authorize your project. This is the document that sells the project to your stakeholders and defines broadly what their return in investment will be. It’s like elevator pitch, so it has to sell the project. It serves as a primary sales document. When you present this to the stakeholders they now have a summary to distribute or present when approached about other projects, so they can focuses their resources where they’re needed. This is a document that stays with you throughout the life cycle of the project. You will be referring to it throughout, whether at meetings or to assist with scope management.The charter acts like a roadmap without all the minutia to distract you in other project materials. There’s a process for writing a project charter, which starts with knowing what is the vision of the project. That vision statement can’t be vague, but must capture the purpose of your project, defining the end goal for the project team. Once you have the vision clear, then you can break it down into more practical bits. Objective. List three to five objectives of the project, be SMART: specific, measurable, achievable, realistic and time bound. Scope. Now outline the formal boundaries of the project by describing how the business may change or alter by delivery of your project, also note what’s relevant to the project and what is not. This is how you maintain better control of the project. Deliverables. Describe each of the deliverables the project is tasked to produce. Once you’ve gotten all of them down, you’ve got a foothold on your charter and are ready to move on. Customers/End Users. To complete this list, ask yourself: What is a customer and/or end user in the context of this project? Who are the project customers? Is there a specific individual or entity responsible for accepting the deliverables of the project? Stakeholders. As noted earlier, identifying the stakeholders of the project is crucial. They are the person or entity within or outside of the project with a specific key interest in that project. It might be a financial controller overseeing costs or the CEO, but whoever it is they’ll have a slightly different focus depending on their role. Roles. You need to assign the key roles and responsibilities to those involved in delivering the project, from the project sponsor, project board and project manager. After each entry write a short summary defining their role and what their responsibilities are in the project. Structure. Now you need to define the lines of reporting between these various roles in the project. Use a project organization chart to do this. It diagrams the structure of an organization and the relationships and roles of those involved in the project. Plan. If you’re going to implement, then you need an implementation plan. This is a way to develop an atmosphere of confidence for your customers and stakeholders by listing the phases, activities and timeframes of the project’s life cycle. Milestones. Milestones mark major phases in the project and collect smaller tasks into bigger chunks of work. The project should only have a few of them, that’s why they’re milestones, but they are an important way to acknowledge the completion of a key deliverable. Dependencies. List all key dependencies and what their importance is to the project. These are tasks or an activity that are linked to one another, as they will impact the project during its life cycle. Resource Plan. What resources are involved in the project? Break down this list into labor, equipment and materials. This is how you’ll know what you need before you need it, and you’ll be able to estimate your budget more accurately. We’re almost done, but no charter is complete without collecting the potential risks and issues that can derail a project. This includes assumptions and constraints related to the project. An issue is something that has already occurred in the project. Basically, a risk is future tense and an issue is present tense, but you have to be prepared for any and all eventualities when creating a project management charter. Finally, with all the above information, you can sketch out a rough figure on how much it will cost to deliver the project within the timeframe you’re allowed. Then you present your charter and once it’s approved and signed the real work begins. Once you’ve written your project charter and have approval from your stakeholders, then you’re going to need the right tools to manage the scope, tasks and resources of your project to ensure you bring it in under budget and on schedule. ProjectManager.com is a cloud-based project management software that reports instantly when statuses are updated, so you know where your project is and how to keep it moving towards a successful completion. Try it now with this free 30-day trial.